If you’ve clicked on this tab, you most likely want to hear the story of the rise of the Bacon Board Gamers. Well, sit back (hopefully with a few tasty snacks) and I will tell you the epic tale – from the club’s humble beginnings to the majestic position it now occupies as the most popular bacon-themed college board game club in the world. The story begins with a small group of intrepid young students at Northern Essex Community College. These students had two things in common: they loved games and they were stuck in Mike Cross’ chemistry class. They soon found that Mike loved games as well and the idea of forming a club began to stew within their minds. 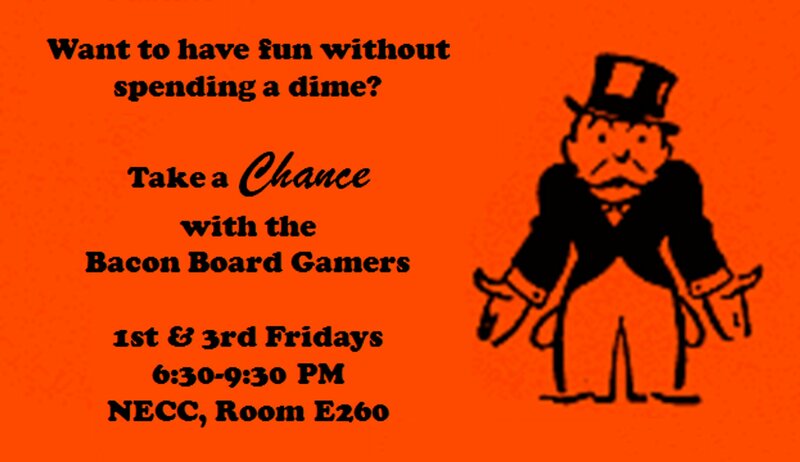 After a lengthy period of consideration (approximately 2.3 minutes) it was agreed that a board game club was not only a brilliant idea, but would provide a desperately needed haven for board gamers in the Merrimack Valley. And thus, on a brisk autumn evening in 2011, the Bacon Board Gamers were formed. The beginnings of the club were humble and dark (mostly because the meetings were held at night). Despite the heroic efforts of club president, David Bowie (yes, Goblin King David Bowie), only a few people initially attended the meetings. But although the club was small in size it was big on ideas. The club applied to the Campus Catalyst program and was awarded bounteous funds. And what did they do with these funds, you ask. They purchased a massive selection of the latest and greatest games, of course. And did they hoard these games for themselves? Nay, but they did establish a board game rental system (like unto Netflix for board games) and they did share the joy of games with all who were interested. At this point the accolades began to roll in faster than a New England thunder storm. They were voted “Most Likely to Succeed” at their first Campus Catalyst showcase. Their efforts were recognized and commended by Mayor Fiorentini of Haverhill. They were even awarded the prestigious Presidents Cup by Lane Glenn and NECC. The media did not fail to take notice of the rising star status of this fabulous club. The Haverhill Gazette, Eagle Tribune, Newburyport Daily News, WBZ Radio and the Boston Globe featured stories of the Bacon Board Gamers amazing exploits. Now that the Bacon Board Gamers have achieved such lofty heights of stardom only one thing is missing… YOU! That’s right, if you are reading this and you aren’t already a member of the club, you should be. Join the Bacon Board Gamers for fun and friends – all with a hint of bacon. Yeah I’m not sure who this goes to but I went to pax east today and if u r interested in going there are a lot of people selling extra tickets on reddita.com. just look under paxpassexchange. Most of the people I talked to were from out of state and had someone who couldn’t make it and just wanted a way to get their money back. There are many many board games there. There is an entire area dedicate to table top games. I got a couple I’m bringing to bbg. All games seem to be at least 20% off. Don’t buy from the first place you go to. The prices are competitive. I’ll see you next friday. I see Diversions Puzzles and Games has strategy games every Tuesday at 5PM . I see they just posted that they were looking for help on Saturdays. Diversions is a fabulous place for gaming. I’ve made it to a game night there once and it was wonderful. They also have a cupboard full of games that you can pull out and try.